a guest post from actor, comedian, and voiceover artist Eddie Deezen. Visit Eddie at his website or at Facebook. In the early months of 1960, Williams had sent one of these local bands to Hamburg, Germany, to play. This first group was Derry and the Seniors, one of the hundreds of Liverpool bands which existed at the time. This experiment had proven successful and now, an “entrepreneur” in Hamburg, Bruno Koschmider, was asking for a second band to come over and play for his nightclub customers. Williams’s first choice was a top-rate local band called Rory Storm and the Hurricanes, which featured a flashy drummer named Richard “Ringo Starr” Starkey. But Rory and his boys were booked up, at the time committed to playing the summer at Butlin’s Holiday Camp. Williams also tried to get Gerry and the Pacemakers, but they too declined. Hard up to find a group, Williams next asked the Beatles, who happily accepted. When Derry and the Seniors heard who was the next Liverpool band to be sent to Hamburg, they were furious at Williams for choosing a “bum group like the Beatles.” Having already heard the fledgling Beatles play in Liverpool, they figured the group would be so bad they’d ruin the fun and partying they were having for everyone. 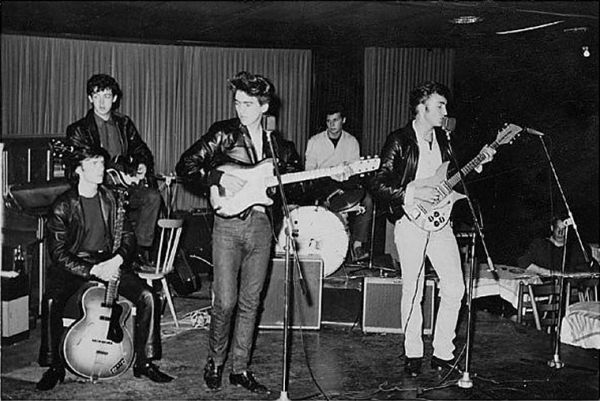 The Beatles at this time consisted of John Lennon, Paul McCartney, George Harrison, and a very moderately talented bass player named Stu Sutcliffe. 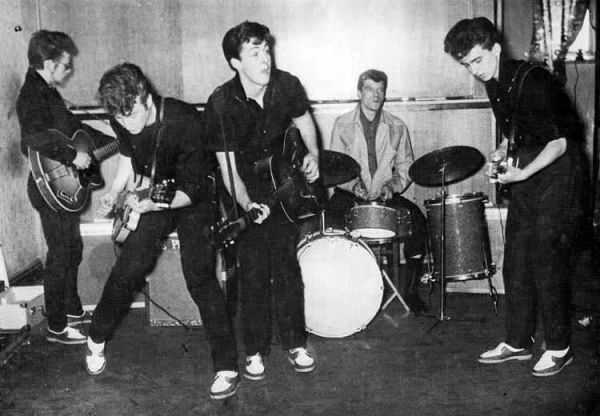 Having accepted the Hamburg offer, the Beatles needed a drummer and pronto, so a mere formality audition was held with Pete Best, a local drummer who had played with a band called the Blackjacks -and of course, he passed. A motley crew of nine entered a Hamburg-bound, battered old Volkswagen van on August 16, 1960, the passengers being John, Paul, George, Stu, Pete, plus Allan Williams, his wife Beryl, his brother, plus a local character named Lord Woodbine, who did the driving. With them in the cramped van (besides their instruments) they carried their new stage outfits- matching lilac jackets, which had been sewn by a neighbor of McCartney, and a container of scones to eat along the way, baked by Harrison’s mother. On the way to Hamburg, they group drove through Holland, where they stopped at a music store. Much to Williams’ fury, Lennon shoplifted a new harmonica from the shop. (Trivia: Lennon was to keep this harmonica and play it on the Beatles’ first record “Love Me Do” two years later). After finally making it to Hamburg, the group finally arrived at the club they were booked to play in, a filthy dive called the Indra. The Indra was a cheap second-rate club frequented mainly by gangsters, hoodlums, drag queens, prostitutes and drug dealers. Worse still were the living quarters for the five Beatles. They were housed in what Lennon was to describe as “a pigsty,” located behind a cinema, right next to the ladies bathroom. McCartney was to recall: “The room had been a stove room, and there were just concrete walls, with nothing else. no heat, no wallpaper, not a lick of paint.” There were stark bunk beds for the five to sleep on, they used Union Jacks for blankets to keep warm on the freezing cold Hamburg nights. The Beatles were awakened each morning by the sound of the cinema coming on. When they wanted to wash, they had to wait for the German fraus to leave the ladies room, which they would then wash up in, using the toilets for water to wash and shave. The entire area now surrounding the five Liverpool teenage boys was, in fact, a world of vice called the Reeperbahn, specifically a narrow street called the Grosse Frehieit, where booze and drugs were everywhere and hookers openly plied their trade in shop windows. The Beatles would play for hours upon hours each evening- sometimes playing as long as eight hours a night. They went through their repertoire of oldies, including Elvis, Little Richard, Chuck Berry, and all the greats of the day. The majority of the singing chores were carried by John, Paul, and to a lesser extent, George. 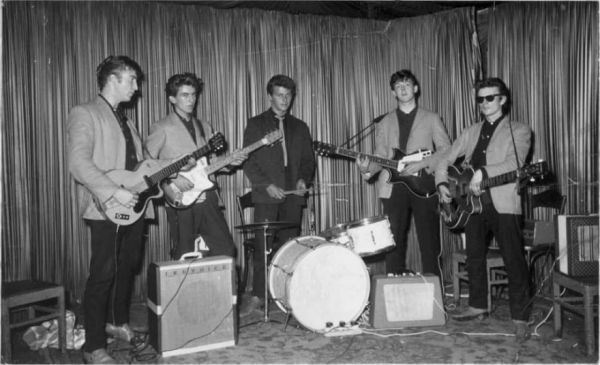 Stu had his one big number, Elvis Presley’s “Love Me Tender.” And even the very shy Pete best would hop off his drums nightly and sing his one solo “The Peppermint Twist,” the German frauleins swooning at his brooding good looks. Because they had so much time on stage to fill, they would sing chorus after chorus of the same song, often making it last fifteen or twenty minutes. Their big number was Ray Charles’ “What’d I Say,” a song which on one occasion, the boys played for 90 minutes straight (the various band members would go offstage to drink and wash up at different times during this amazing rendition). The gangsters would come to the Indra to hear the Beatles play and would send them up crates of beer. The Beatles were coaxed and urged on by yells of “mach shau!” (“make show!”) by the gangsters in the audience. The Beatles would drink the beer, combined with a drug called Preludin (or “prellies”), which was a stimulant that kept them awake, jumping and singing through the night. With the combination of beer and prellies, the band members would often be wide awake for days on end, sacrificing sleep for being onstage and entertaining the ever-growing crowds. While Paul would take one prelly at a time, Lennon would take four or five at once. This, combined with John’s natural craziness, resulted in Lennon’s very bizarre behavior. Once, he appeared onstage wearing nothing but his underpants and toilet seat around his neck. Another time, to win a bet, he went outside onto the streets wearing nothing but a pair of long johns, where he casually read a newspaper. As the band would come onstage, John would greet the crowd with a “Heil Hitler,” he would call them “krauts” and take out his black comb, place it under his nose, and do a Hitler imitation, Nazi salute and all. The crowd loved it and ate up John’s act. Back in their living quarters, John would often urinate off the balcony of the room they were staying in. Once, according to Williams, he relieved himself on a passing group of nuns. The Beatles sexual appetites were assuaged by the many hookers and prostitutes who became their early fans. George Harrison, a virgin when he left Liverpool, had his first-ever sexual encounter with a Hamburg prostitute in their dank bedroom. After the deed was complete, the other Beatles gave George (and his bedmate) a hearty round of applause. These puerile antics aside, the trip to Hamburg was to prove a metamorphosis in another, much more significant, way. A bunch of rank amateurs when they started, the Beatles, through the process of playing five, six, seven and eight hours each night, became tighter and tighter as a band. After a hard night’s work, the musicians would troop back to their sleeping quarters, crashing out until they were awakened by the Bambi Kino cinema. They would then wearily walk to the local Seaman’s Mission, where they would dine on their standard breakfast- beer and corn flakes. It was a life of constant, seemingly never-ending work and practice onstage. 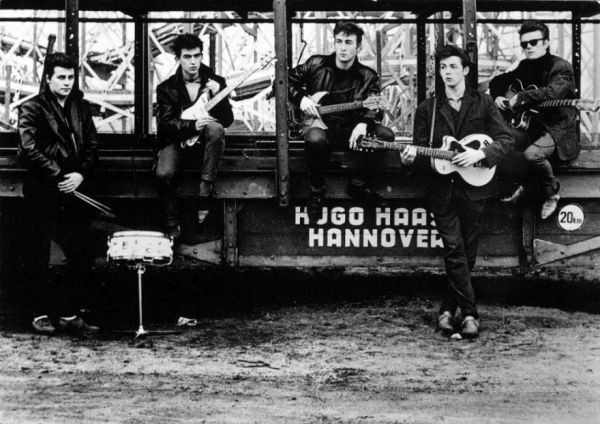 Hamburg would prove to be the Beatles “trial by fire,” where they would go from the status of second rate, would-be musicians to a top-notch, incredible band. The crowds at the Indra, which were meager handfuls when they arrived, had grown bigger and bigger, until the club was teeming nightly with Beatle-loving rock ‘n’ roll fans. This trip to Hamburg was to be the boys’ “turning point” as a band and they would never look back. The Indra club eventually had to close down because of complaints about the noise. 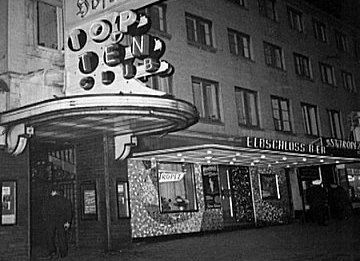 The Beatles moved out to play in another club called the Top Ten Club. But soon, George was discovered by the authorities and deported for being underage (George was only seventeen at the time). On November 21, George was deported and flown back home to Liverpool. When they were packing to leave their disgusting and dank Indra sleeping quarters to move to their nicer Top Ten Club quarters, Paul and Pete best used a condom, which they set of fire, for light to be able to see as they packed. Koschmider, who was angry at the Beatles, reported that Paul and Pete had “tried to burn down” his club. The police corralled the two Beatles, detained them for a few hours at the station and the duo was sent back, by plane, to Liverpool, too. Poor John had to take a train home all alone. Stu had fallen in love with an attractive Hamburg lass named Astrid Kircherr and decided to remain with her in the German city. Back in Liverpool, the weary Beatles did not contact each other for a few weeks. John recalled being sad, he came home from Hamburg broke and had no money to buy Christmas presents. But John also had to make a much bigger decision, i.e. he had to decide whether to keep the Beatles going. After their ignominious ending in Hamburg, John thought it might be the end of the road for his band. Fortunately, he and his fellow musicians did get back together. And as we all know, they kept playing. They got better and better and better, as musicians, singers, and of course, as composers. In a few more years, they were to conquer the world and become the most famous, influential and beloved rock group of all-time. 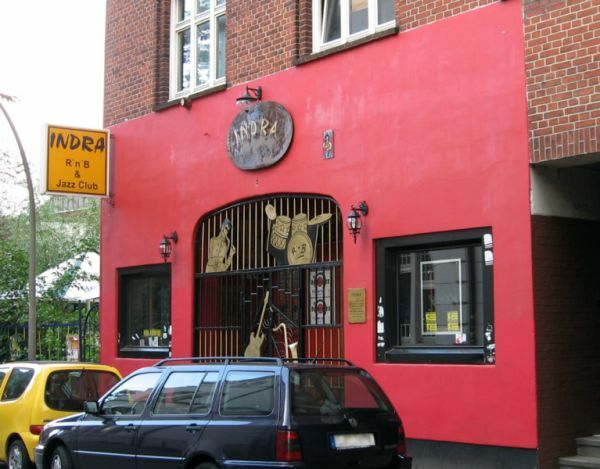 But it was in Hamburg, Germany, in a dingy little club called the Indra, where it really all started. And thus it was for all the Beatles.